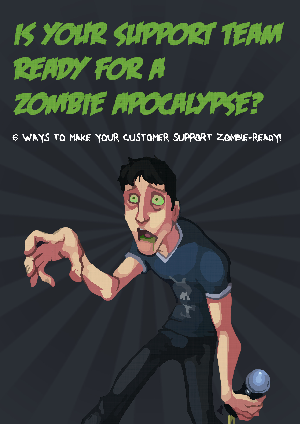 > Freshdesk > 6 Ways to Make Your Customer Support Zombie-Ready! A Zombie-apocalypse is not something that keeps most support teams paranoid about. After all, it isn’t something that happens every day. But that is exactly what’s so scary about it? Zombie attacks can stem out of pretty much anything, right from a barrel of toxic gas that was accidentally opened, to a Black Friday sale with deep discounts on the latest gadget. And you can be pretty sure that the attack is going to start quick and grow big with very little warning. Unless your support team is ready when it strikes, you might wake up the next morning to find a burnt-up help desk, and a lot fewer customers. So how can you can you get your customer support to be ready for the zombie apocalypse? This guide will walk you through everything you can and should do to make your support team proactive before the zombies rise, effective during the attack, and heroes after.